I recently happened upon Death Rides a Horse on the Encore Western channel late one night. I saw that it starred Lee Van Cleef (one of the greatest) so I decided to check it out despite the blurb review in the channel guide. The blurb gave it two stars and said it was a "standard tale" about a cowboy out to revenge the death of his family. How horribly wrong the dolt that wrote that was! 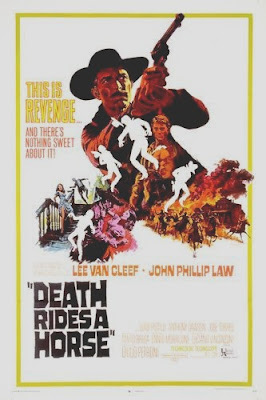 Although Death Rides a Horse could be subjected to many of the criticisms applicable to most spaghetti westerns, labeling it “standard” is a grave injustice indeed. The film begins with a brutally violent scene in which we see through the eyes of a young boy as his family is shot in cold blood by a gang of outlaws, the mother and teenage sister are raped before being shot. The scene is truly unflinching. My wife remarked that she had never seen a film so starkly portray the murder of a child. The outlaws overlook the boy and he survives and grows into a deadly gunslinger fueled with the mad desire to avenge his family. The gunslinger is played by John Phillip Law. Law is no Eastwood, but he is okay. His acting is a bit flat and he voices his lines in a deadpan deep baritone, kind of like a John Wayne in slow motion. For me, Law's "so bad its good" performance only adds to the film. Law runs into Van Cleef and they discover they are after the same group of outlaws. Van Cleef wants money from the bad guys, while Law wants them dead. Thus, they find themselves in a game of one-upmanship, each trying to get to the bad guys first. I felt the first half of the film to be at the level of masterpiece. The stark landscape, violence, and most of all the jarring Ennio Morricone score, set an almost hallucinatory mood. There are a couple of the best revenge killing scenes ever put on film. The movie does degenerate into a bit more “standard” Western fare in its third-act. The finale sets Van Cleef and Law in a small Mexican village, which they must defend against a force of bad guys that has somehow quadrupled in size. There is a predictable plot twist, but the ending is well-done. Van Cleef, the Morricone score, and the terrific first hour elevate the film well above some two-star "standard". 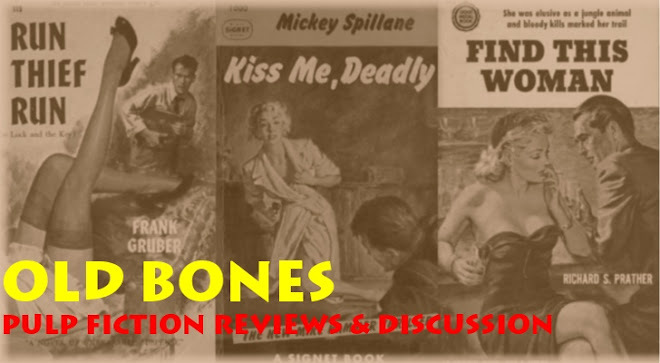 This post is a bit off-topic for this blog, but I enjoyed the film so much I wanted to point it out to any noir lover that also likes westerns, and particularly spaghetti westerns. Even though it lacks Clint Eastwood, it is a real treat. An interesting side note - Quentin Tarantino incorporated several elements of Death Rides a Horse into Kill Bill, including the score and the hero “seeing red” when encountering the bad guys. This is a great western - Van Cleef is excellent and the story zings along. Love this one, myself. I recently got it in a box set with another three westerns but this is easily the best one on it. I've always enjoyed this film too. I have a copy in my small collection of western films. Have the soundtrack on record too...somewhere. Good film - good acting - great soundtrack. What more can you ask for?